Forty-eight hours after having my appendix removed, and I was in a daze. I was stiff. I was sore. I hadn’t had a good poop in over half a week. I was bored. My beautiful boat was at sea without me while I was stuck recovering at my cousin’s house in Boston. The whole thing felt rather surreal. 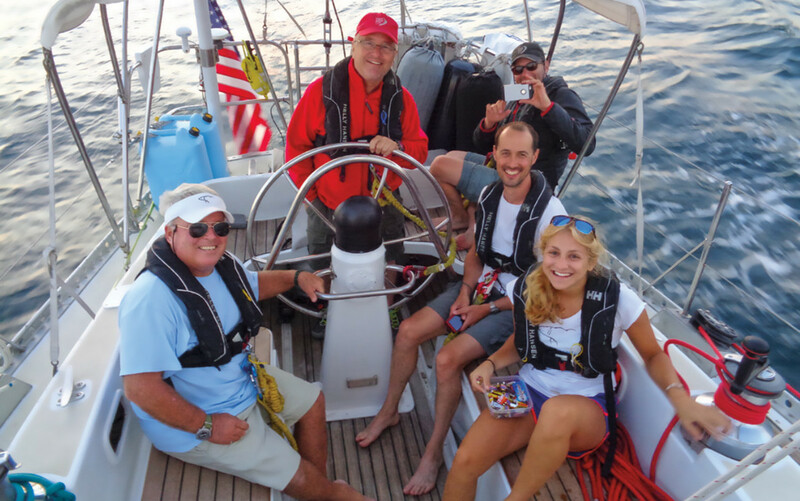 We left Annapolis on a beautifully clear Saturday morning, July 2, with a brisk northwesterly blowing cooler, drier air behind a strong cold front that had passed over the night before. Isbjorn, the Swan 48 we use as a charter boat for taking paying passengers offshore, sailed all the way north on the Chesapeake to the entrance of the C&D canal on one tack. The wind was very shifty, heading us then lifting us as our crew, consisting of Bruce, Lance, Jim, Mike, Liz, my wife, Mia, and me, constantly trimmed sails. By dawn Sunday morning we were offshore off Cape May with just enough wind to hoist the spinnaker. As we did so I noticed that my stomach was hurting a little, but put it down to the pasta from the night before, which normally doesn’t sit well with me. I had a fitful night’s sleep. By next morning I’d lost the taste for coffee, a bad sign. “There were a lot of weird noises coming out of the head!” Bruce said, and he was right. I had been in and out all night and most of Monday morning as well in a failed attempt to dislodge whatever was causing the malady in my bowels.To make matters more “real,” so to speak, in Portsmouth just two weeks earlier during the ARC DelMarVa rally stopover, one boat’s crew got similarly ill in the men’s bathroom, with dire consequences. Ultimately, that guy went to the hospital later that same day and didn’t come out for a week;they had to remove 8in of his intestine that had become necrotic after a blockage caused by who knows what. He nearly died. That said, nothing ever happens to me, right? Was I just being a big sissy, or was I really sick? I’m used to pushing through pain, mentally and physically. When not sailing, I enjoy endurance sports, and from skiing to cycling to ultra-running have completed a whole bunch of physical feats that require that you ignore the pain to successfully get to the finish line. Soon afterward Mia got the satphone out of its yellow Pelican case; by then I was in the fetal position on the cockpit seat, weak, tired and in pain, not wanting to stand, sit or even speak. She was in charge now. She called my dad first to tell him we were diverting toward Newport, then contacted the Coast Guard to issue a pan-pan (more on this later). The crew was briefed. The guys and Liz, our 21-year-old intern, mustered on deck. We gybed the genoa off the pole and altered course about 30 degrees to port and aimed the bow toward Newport, about 90 miles to the east-northeast. By 1500 I was in my bunk, permanently. Mia assumed the role of captain, taking herself out of the watch rotation to navigate, communicate with the Coast Guard and take care of me. Bruce, the most experienced crewmember onboard, took over as watch leader, and the rest of the crew continued its normal routine. Liz, who knew the boat the best as she’d been working with us for a few months, kept everyone sailing well. The wind was up even more, and ironically this was the best sailing of the whole trip. Sleep for me down below became less and less possible. 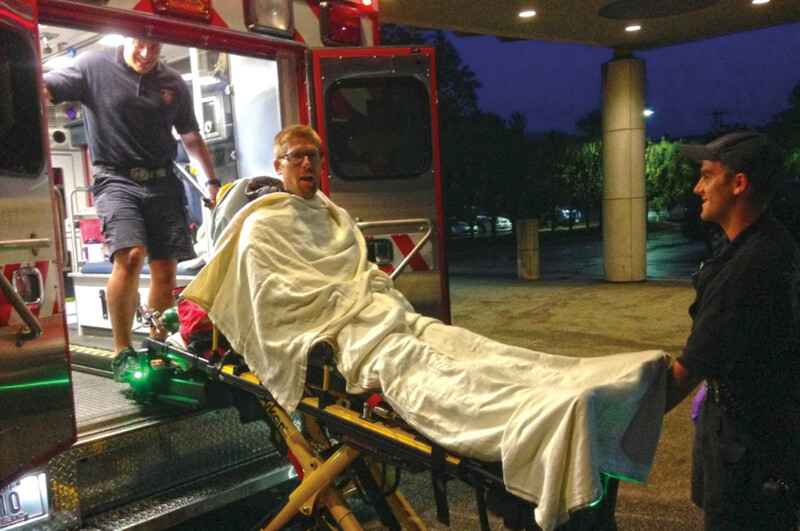 It was about 0400 on Tuesday, a little more than 60 hours after my symptoms first appeared, that we approached Newport. I struggled out of bed and into my sweatpants. I had a fever running by then too so that I was shivering badly. The rainy, dark night didn’t help. The ambulance arrived as promised just a few minutes later. They wrapped me in blankets, took my vitals and by 0500 were lifting me off the gurney and into the ER of Newport Hospital. By 0530 I’d had my first shot of morphine. By 0900 I’d met the surgeon who briefed me. The appendix, thankfully, hadn’t appeared “frankly ruptured,” as she put it, on the CT scan, but she wouldn’t know for sure until she cut me open. One way or the other, it was coming out. By 1130 they were rolling me into the operating room, and by 1700 that same day I was back on the street, walking (albeit slowly) back to the boat. 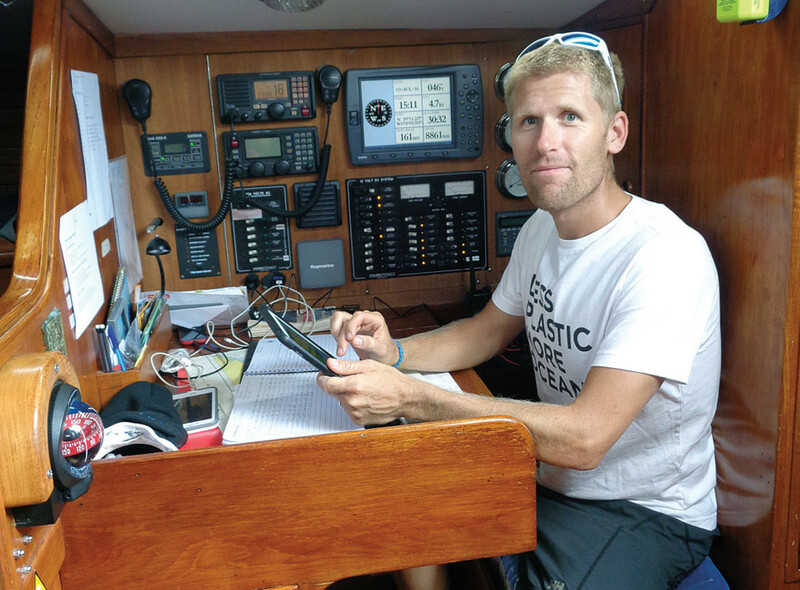 By then the crew had moved Isbjorn over to a mooring. We took the Old Port Marine launch out to the boat, where an unsuspecting crew was astonished to see me return from the dead. In the end, Isbjorn would only lose 24 hours due to the stop, thanks largely to Mia and the rest of the crew’s ability to step up to get the boat safely into Newport—that and my dad’s willingness to fill in as my relief captain, basically on zero notice. My surgeon informed me that the first five to seven days were crucial in the healing process. If I didn’t develop an infection, I’d be good to go back on the boat, albeit in a minimized role, in time for the next trip. I wouldn’t be able to lift anything more than 20lb for the next four to six weeks, as I was at a high risk for a hernia since they’d sliced open my abdominal muscles. But I could still lead. I joined the boat a few days later after flying to Halifax. Exactly one week after my surgery I was headed back offshore on the cold, foggy leg up to St. John’s, Newfoundland. In total, Isbjorn sailed over 3,000 miles in six weeks, visiting Newfoundland, St. Pierre, Sable Island and Nova Scotia before returning to Annapolis. I healed fully in four weeks and was back to my old self before the trip was over, even climbing the rig offshore to take photos. All’s well that ends well. I’d had identical symptoms back in November and learned from the surgeon that what I had experienced then was probably a mild flare-up of appendicitis that my body was able to heal by itself. The fact that I recovered so quickly then was part of what kept us offshore longer than we should have been—I thought it would pass. • Next time we’ll carry some high-test antibiotics on board, which can slow the onset of appendicitis once the symptoms start showing up. Far from shore, for example on a transatlantic passage, you’re looking at a minimum few days until primary care—perhaps a transfer to a commercial or military ship and a helicopter ride, probably to a foreign country. A daunting thought. • I put thoughts of the business ahead of my own physical condition, a really stupid thing to do. Nothing is as important as the health of the crew. Crucially, we had a plan—transitioning me out of the role of captain was only as difficult as consulting the contingency checklist and implementing what we’d previously discussed with the entire crew before leaving the dock. •We issued a satphone pan-pan with the Coast Guard. Mario Vittone, a former USCG rescue swimmer, says the pan-pan call is the best way to avoid having to issue a mayday but is dreadfully under utilized. Mia got on the phone and informed the USCG of our position, the situation onboard and what we were doing about it. If it had ever gotten to the point where we needed a MedEvac, it wouldn’t have been the first time the USCG had heard about us and they’d be able to get to us quicker. • I’d never, ever go even near-coastal without a satphone. The technology is too good and the service too cheap not to (and no, I don’t think SSB is a good-enough replacement—the USCG stopped monitoring the emergency frequencies long ago and some novice crew might not be able to operate it). •We had a medical guide onboard—two in fact—consulted them, and followed their advice! You can’t mess with abdominal pain.